As much of the United States reels from a week of violence that left two civilians and five police officers dead in Louisiana, Minnesota and Texas, Wieden + Kennedy has received attention both within and beyond the ad agency world for making its own statement on #BlackLivesMatter, the social media-driven movement that inspired protests across the country. We are asking ourselves what to do. We are hurt because it feels like watching our own selves get gunned down. But we're scared for our lives, our family's lives, our friend's lives. We're mad that the protests aren't working. Why the video recordings aren't working. We're conflicted, in a place between crippling empathy [and] contempt at a world that seems not to care enough. We are wondering the point of a moment of silence. We are wondering if we ourselves will make it back home today. We are wondering what to do, what to do, what to do. Just an FYI, not for sympathy. Just acknowledging this because it should be acknowledged. A link embedded within the hashtag currently leads to a general Twitter search for #BlackLivesMatter. At the moment, viewers cannot access any other pages on wk.com. A Wieden + Kennedy spokesperson declined to comment on the site change. But sources with direct knowledge of the matter told Adweek that the decision stemmed from an agency-wide conversation that began Wednesday, the day after the shooting death of Alton Sterling in Baton Rouge, La. Two police officers killed Sterling Tuesday night in an incident multiple bystanders caught on tape. On Wednesday, the Department of Justice announced its plans to open a civil rights investigation into his death. 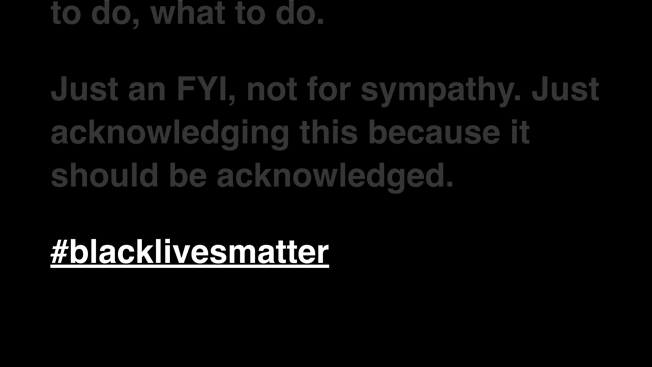 The same morning, an African-American employee of Wieden + Kennedy sent the note now adorning its website to other staffers via an internal email that served as an attempt to help colleagues better understand the very real, human faces of the #BlackLivesMatter movement. It was less a moment of catharsis than a depiction of the raw emotions that have driven this group from a simple hashtag to the subject of headlines around the world. Afterward, leaders at Wieden + Kennedy discussed the note and decided to place it on their site just over 24 hours after it was first sent. According to Adweek's sources, executives made this decision in an effort to demonstrate support for their own employees, to encourage a positive dialogue within the agency and to expose others outside the organization to one particular point of view with the ultimate goal of deepening the public's awareness of the factors that have inspired #BlackLivesMatter. So far, the agency stands alone within the advertising industry in choosing to bring attention to this highly impassioned subject.